This post looks at Daiga Grantina’s installation ‘Toll,’ to consider the how the sculpture could be used as a starting point for designing a children’s material-led play environment. I am still recovering from the awesomeness of all the modern and contemporary art I encountered on my recent trip to Paris. A highlight was seeing Daiga Grantina’s gigantic, multi-media sculpture, ‘Toll’ at the Palais de Tokyo. In this post, I take a closer look at Daigna’s experimentation with materials in the installation. I then consider how this could be used as a starting point for children’s creative learning. 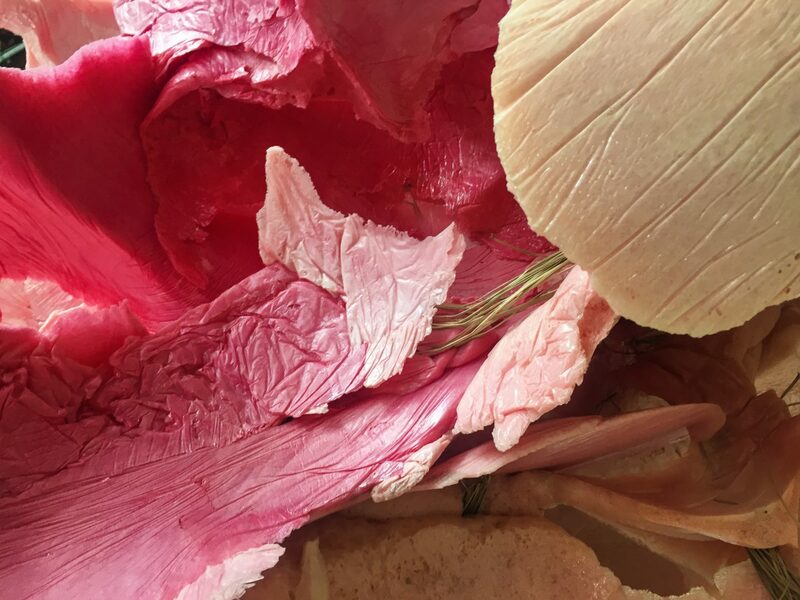 This post is part of a four-part series looking at artist’s innovative ways of working with materials and how this can be used to support children’s creativity. The first two posts looked at the art of French sculptor, César Baldaccini and American textile artist, Sheila Hicks. Check them out if you have not already! Daiga Grantina is a Latvian-born contemporary artist who lives and works in Paris. 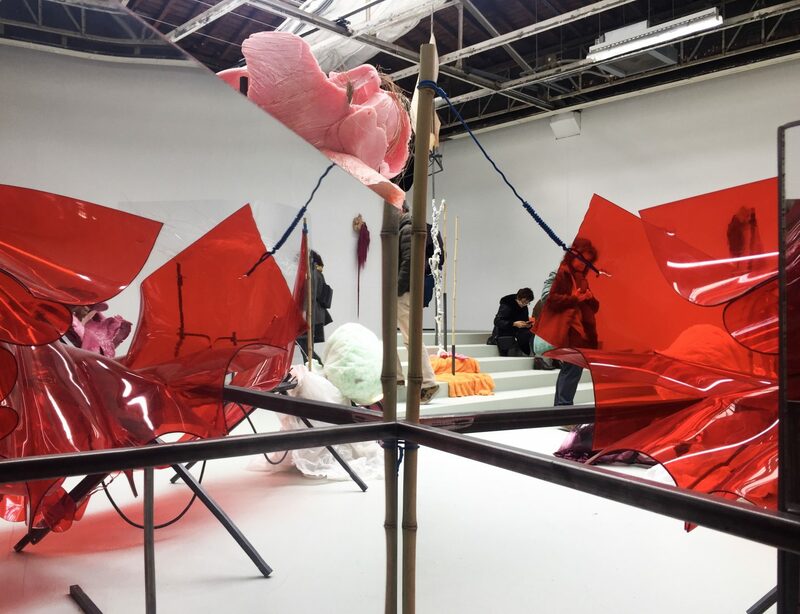 Her site-specific installation, ‘Toll,’ is currently on display at once of Paris’ most famous contemporary art centres, the Palais de Tokyo. I am not exactly sure where to begin describing the sculpture – it is chaotic and random yet also has a vibrant and alluring physicality to it. The artwork features colored oval-shaped molds, transparent plastic sheets, flexible tubes, resin (?) flowers and a huge plastic red ‘wave.’ These individual parts come together to form a complex, imperfect whole. 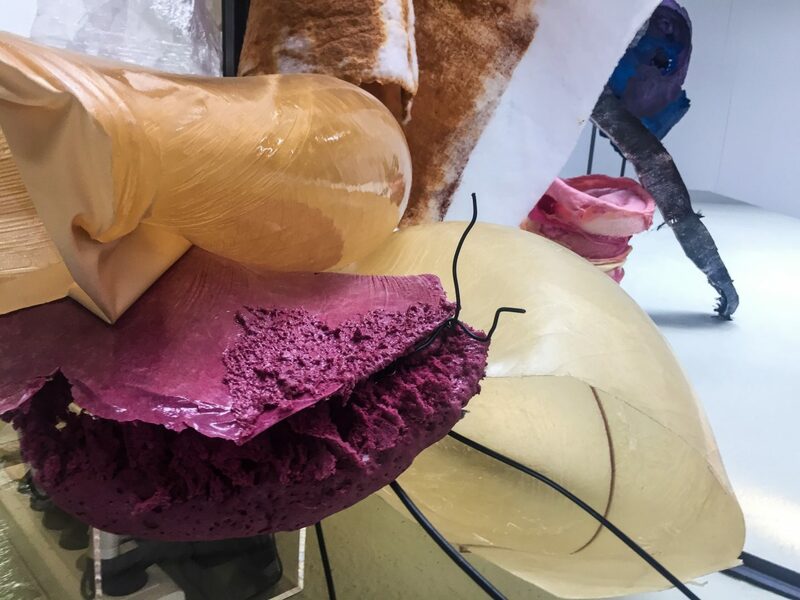 Each material in the assemblage seems to have vastly different properties – some translucent, others opaque, soft, hard, tall, heavy and light. The individual structures inside the installation range from minuscule to dramatically over-sized. Despite the dramatic variations, the components also seem perfectly balanced. The word ‘toll’ apparently means mad or astounding in German. The artwork is both of these things – a hotchpotch yet simultaneously aesthetically spectacular. The art museum describes the piece as “a huge sculpture that explores the vitality within matter.” I love this! So true. The material’s vibrancy and dynamism really drove my interest and thinking through the artwork. The installation’s spontaneous and improvised arrangement was wonderful. The part’s playful positioning produced a feeling of living energy. The arrangement felt like it had been driven by a process of intuition as opposed to painful intellect. Interactions between the sculpture’s diverse elements produce unexpected and beautiful formations. For example, light travelled through the translucent plastic to produce colourful refraction and shadows on the wall (pictured below). I have selected two focus points from ‘Toll’ as starting points for children’s creative learning through play with materials. These are plastic and arrangement. In the following section, I use four questions to consider how this material and concept could be used to produce a children’s learning environment. What types of plastic could be used to encourage exploration of ‘arrangement?’ Ideas: I would firstly do a search for recycled pieces of large plastic such as acetate, laminate (you could visit your local laminating or print shop and ask for cut offs) and large plastic sheets (like from a creative reuse center). Large rolls of cellophane could also look visually beautiful but possibly not so friendly for the environment. Smaller plastic items could include recycled plastic takeout containers. You can also find affordable acrylic plastic panels of various sizes on Amazon here. What other concepts relating to arrangement and plastic may children explore? How could these be introduced as vocabulary words while children are experimenting with the materials? This question is also a good prompt when looking at the documentation of children’s play. Ideas: Composition, translucency, transparency, balance, weight, size, measurement, scale, height, angles and colour mixing. What art tools and equipment could support this experimentation? Ideas: A metal or wooden frame that children can use to position materials on – like this A frame – that children can use to position materials on/around. Pegs, clips, masking tape, lamps and an overhead projector that could magnify the scale of the colourful plastic. Older children may even like to have a go at making their own plastic moulds using Pinkysil and resin (or another malleable material). What artistic techniques could be introduced? Ideas: Stacking, clipping and positioning particular materials together to get different aesthetic effects. What other creative possibilities for ‘Toll” can you think of? I love getting everyone’s messages about their experimentation with art, materials and children’s learning – I started a hashtag #artplaychildrenlearning so we can share ideas and documentation. I got a message about a study group that was set up in Lisbon out of last week’s post – so cool. Hope there is more of this to come! Keep experimenting, keep questioning and keep making stuff! Here is a link to some installation shots from another artwork by Daiga Grantina’s titled “Legal Beast Language.” I love how she works with light and reflective materials in this sculpture!